Engineers blame the December launch failure of a Proton rocket and Breeze M upper stage on bearing damage from overheated propellant ingested into the Breeze M main engine, according to a statement issued Thursday by International Launch Services. The Breeze M upper stage, burning hydrazine and nitrogen tetroxide propellants, was supposed to fire four times to inject the Russian Yamal 402 communications satellite in a high-altitude transfer orbit. But the Breeze M stage prematurely shut down in the fourth burn, and investigators traced the cause of the Dec. 8 mishap to bearing damage on the oxidizer side of the Breeze M engine turbopump. ILS said the Breeze M's nitrogen tetroxide oxidizer showed higher than previously recorded propellant temperatures at liftoff and higher than previously recorded thermal soak-back of engine heat, further raising the temperature of the oxidizer. At the start of the Breeze M's third burn about three-and-a-half hours after liftoff, a large volume of oxidizer gas accumulated near the inlet to the main engine, exceeding the engine's design specifications, according to ILS. The higher than expected temperatures caused the oxidizer to evaporate from liquid to gas. "The volume of gas was ingested by the Breeze M turbopump at the start of the third burn, leading to over-speed of the oxidizer turbopump bearing without the cooling normally supplied by liquid oxidizer," the ILS statement said. "The over-speed damaged the bearing, which eventually led to the premature shutdown of the fourth burn." The U.S.-based launch services provider, which is owned by Proton/Breeze M contractor Khrunichev, released more details of the Dec. 8 launch anomaly Thursday. The company issued high-level results of the investigation Tuesday. The Yamal 402 satellite was deployed in the wrong orbit during the Dec. 8 launch, but the spacecraft reached its operational position a few weeks later. Engineers plan no design changes to the Breeze M stage, but officials will improve management of both satellite and Breeze M thermal requirements to ensure adequate margin to prevent future recurrence of this anomaly, according to ILS. 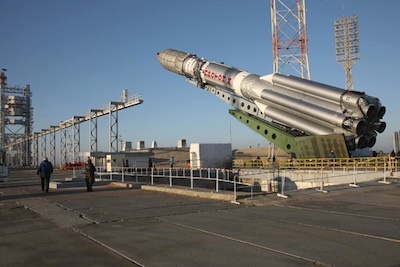 ILS announced the next Proton/Breeze M launch is set for March 26, U.S. time, from the Baikonur Cosmodrome in Kazakhstan. The flight will launch the Satmex 8 communications satellite for Mexico's top satellite operator.